We knew Yorkshire was special but …. Since moving to Yorkshire in 2012, here at French Chef at Home we have come to realise just how special Yorkshire is. We were therefore delighted to find out that God’s own county has its very own day – Yorkshire Day, 1 August. Although we are firmly of the opinion that the delights of Yorkshire should be celebrated 365 days a year, Yves’ has come up with this delicious waffle recipe, complete with rhubarb coulis on the side, which we think is just as special as the county it is celebrating. Making the most of locally sourced ingredients – Ilkley Beer and Yorkshire rhubarb – makes this recipe a fitting tribute to our adopted home.. These waffles make a perfectly indulgent breakfast to kick start your day of Yorkshire celebrations. Cook in a waffle machine. To make the coulis, place the rhubarb and sugar in a pan and cook until obtaining a purée. Then pour in a blender and blend. 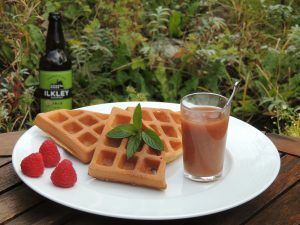 To serve, pour over the waffles some rhubarb coulis. 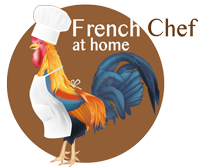 Here at French Chef at Home while we are partial to any celebration, Bastille Day or la Fête Nationale is without doubt our favourite. 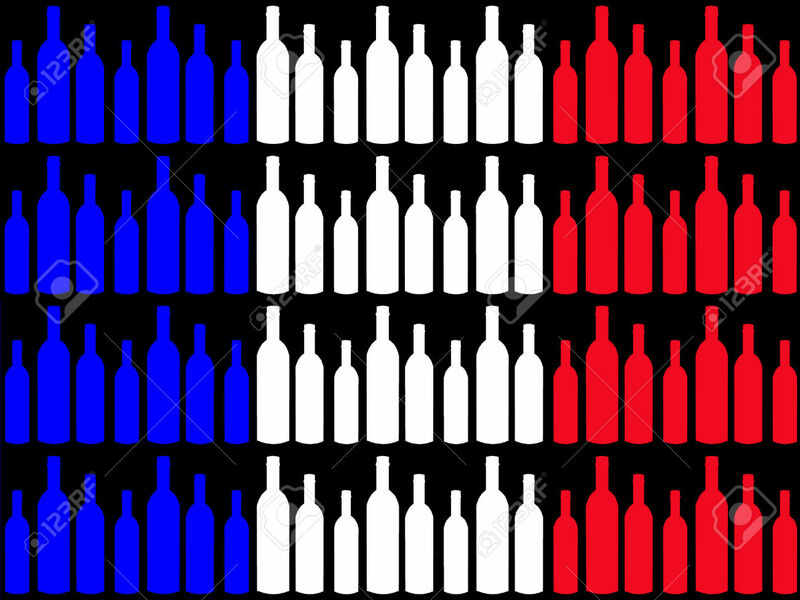 The French National Day commemorates the Storming of the Bastille (14 July 1789) which is considered a key turning point of the French Revolution. Celebrations include fireworks shows (most notably that at the Champ de Mars in Paris), and balls held at fire stations across Paris. One of the most famous celebrations is the oldest and largest regular military parade in Europe. Held every year on the morning of July 14 since 1880, the parade is held on the Champs-Élysées and passes from the Arc de Triomphe to the Place de la Concorde. 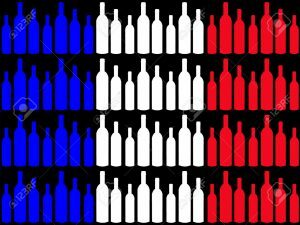 Even though these events are all popular throughout France, many French people keep their Bastille Day celebrations low-key. As a public holiday, locals tend to spend quality time with loved ones and unsurprisingly food takes centre stage. 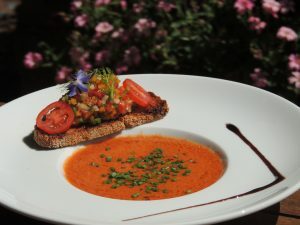 In celebration of Bastille Day, Yves has created this chilled Mediterranean vegetable soup alongside two other ‘terroir’ dishes. Clean the vegetables and slice/dice them into medium sized pieces. Use a blender to mix them altogether. While the vegetables are being mixed, add the tomato concentrate, paprika, basil, salt & pepper and olive oil. Use a sieve to ensure that the mixture is totally smooth. Add the sherry vinegar and serve in a soup bowl. Here you’ll find Yves’ second ‘terroir’ dish that he has created to celebrate Bastille Day. With delicious king prawns, squid and monkfish it’s the perfect main to share with friends and family whether you celebrate this special day or not. Assemble together 1 prawn, piece of monkfish and squid on each skewer, add salt and pepper and marinate in olive oil. Leave it to rest in the fridge. Finely chop 1 shallot, put it in a pan with 50g butter, add the sorrel and leave to cook for a few minutes then add the cream, salt and pepper and leave it to simmer for 15mins. Use a blender to mix the whole, and keep it warm in a saucepan. Chop the second shallot and put it in a pan with the remaining butter, add the rice. Stir and add the white wine. Cook the rice until the wine has fully evaporated, then add the fish stock. Cover the pan with a lid and leave the rice to simmer until the stock has been fully absorbed. 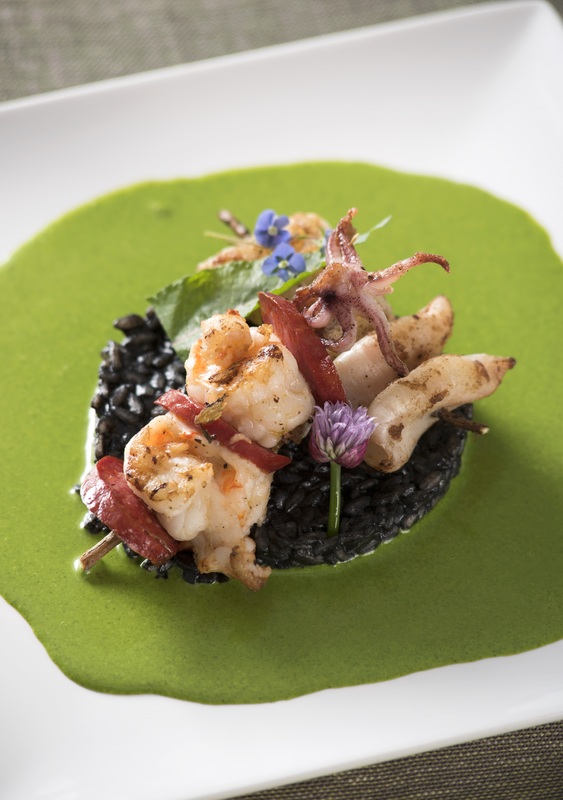 Add the squid ink to the rice and stir until a uniform colouration is obtained. Keep warm. Use a BBQ or grill to cook the skewers for 3mins on each side. On a plate, put the rice in the middle using a 10cm diameter pastry cutter. On top, lay in place 2 skewers as a cross. Add the sorrel sauce all around the rice and skewers.